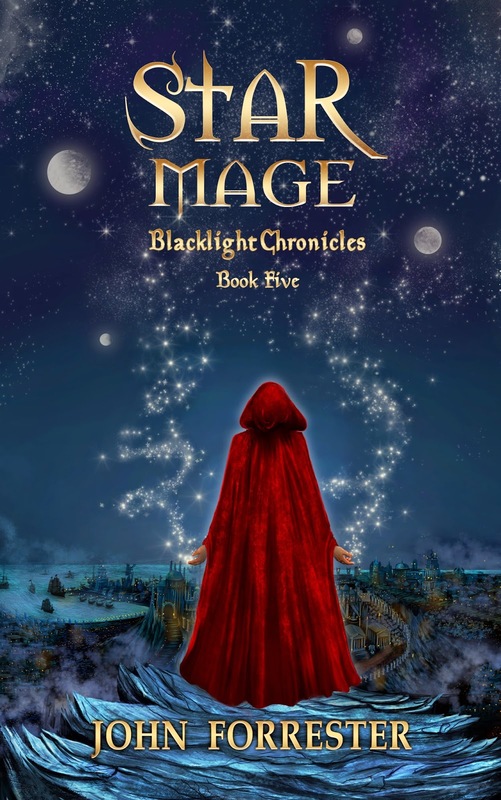 Introducing the fifth book in the Blacklight Chronicles fantasy series, STAR MAGE! The book is available right now on Amazon Kindle. The energy of the black crystal burned strong in Talis’s body as he pressed his palms against the wet ground. He could feel the crystal still alive beneath the desolate wreckage of the destroyed Temple of the Sun. Although he possessed powerful crystals from the heart of Ghaelstrom, there was something special and serene about the feeling of the crystal that the Goddess Nacrea had given him. The Temple would be renewed. The land was still sacred. A few paces away, the spring still bubbled cool water from deep within the earth and spilled into the stream that flowed down to the grassy field below the hill where the temple once stood. Blackened beams and broken stones were strewn across the old temple grounds. What a mess the Jiserians had made of the holy place. But Talis was determined to restore the Temple to its former glory. He lifted his eyes to where a ray of light beamed down onto the burned and broken City of Naru. So much work remained to rebuild their once beautiful city. And only Master Goleth to help in the casting of the spells of building and creation. He had refused to teach Talis the spells, claiming that his vow to an unrevealed god prevented him from passing on the knowledge without the blessing of the masters of his Order. Once in Naru, the Builder had seemed reluctant to help them beyond repairing the core structural damage to the larger buildings and temples. In the days that had passed since their return, Goleth’s distracted face told Talis it was time for them to fly south and return the Builder to his family. “We’ll build a new temple to the Goddess Nacrea.” Mara strode up alongside him and provided a pleasant interruption from his solitude in surveying the hillside. Her hopeful eyes studied him. Should a new temple be constructed again so soon after they’d built the last Temple of the Sun, or should they wait and let the land rest? He prayed to the Goddess that the new Temple would stand and remain strong and protect his city. Unlike the last temple… Was it cursed as Master Viridian had said it would be? “And build stronger walls to protect her.” Talis vowed to do whatever he could to prevent this kind of destruction against his city. Even if it meant forming an alliance with their once enemies in the Jiserian Empire. Or seeking out and killing Rikar, wherever he decided to go and hide. The Starwalkers would come for Rikar, Talis was certain of it. But would they also come and seek revenge against Nikulo for his slaying of the Starwalker known as Jeremiah? Talis doubted it. “Perhaps they’ve captured his wife and family and hold them hostage until he returns.” Talis pictured the joy and appreciation on Goleth’s face when Talis had insisted that the Builder return with them to their world. “Let’s go find out,” Talis said, and changed into dragon form. Mara mounted on his back and with a quick flapping of his wings, rose high into the sky until the city sped by far below. Soon he landed at the grounds surrounding the Temple of Nestria, the Goddess of the Sky, and he changed forms after Mara had dismounted. She pointed at a figure far off in the distance standing and studying the southern horizon. Master Goleth had chosen this spot to rest after long days spent reconstructing the critically damaged portions of the city. The first building Talis had asked Goleth to rebuild was the Temple of the Order of the Dawn, and the massive golden dome that was shattered after the assault on Naru by the Jiserians. Since the wizards of the Order had either fled or been killed after the last Jiserian assault, Talis decided to erase the tragedy of the past and start fresh with a new Temple. He planted one of the crystals from Ghaelstrom underneath the temple, and let it grow in girth and power once it was seeded deep in the earth. Now the temple rose some fifty-feet higher than before, and it towered over that part of the city. “I’ve flown through far worse storms.” Talis thought back to the vicious storm that assaulted them on the way to Ghaelstrom. “Shall we leave now, Master Builder?” He intentionally elongated the last word, hoping to prod the man’s integrity at leaving without completely restoring Naru. “Who is threatening your family?” Mara said, and could see Master Goleth struggle in his thoughts, as if uncertain whether to answer the question. After ten heartbeats the man opened his mouth to speak. Talis scoffed, wondering why the man thought the Jiserians more of a threat, especially with Aurellia so far away from the world. Were the remnants of his followers any real threat? And hadn’t Aurellia summoned his strongest supporters when Elder Raelles was sent here before the armada had left? Was there any real force of power remaining inside the Jiserian Empire? Talis stiffened at the Builder’s condescending tone, but held back a retort and instead considered the wisdom in Master Goleth’s words. If there were a Dark Lord still in the Jiserian Empire, the Nameless, as his followers called him, then perhaps Talis should fear the threat. Too often he had underestimated his enemies, and he wasn’t about to do so again. “What if we can help you ensure freedom for your family?” Mara said, and Talis was surprised at her willingness to help. He knew she was trying to appeal to the man’s emotions. “But is it feasible to pretend that I am your apprentice? Could you convince them?” Talis said, his voice insistent. “It is possible…though unadvisable. I could claim you as a practitioner of magic from Vellia, a boy who begged to return with me and study under my tutelage. Your face is unknown in Ishur and likely the masters of my Order would believe me. And you have been craving to learn the spells of creation and elemental assembly. But I would warn you to speak nothing of what I have revealed to you…not once. And if trouble arises then escape and flee back to your city.” And not in dragon form, Talis told himself, certain that a magical portal was the safest way out of Ishur. “Can’t your magic be taught?” She retorted, a stubborn expression fixed on her face. Talis knew from experience that magic could be taught, but it had taken him many difficult years to cast spells outside training dreams. And he had only been admitted into the Order of the Dawn since the gift of magic existed in his family lineage. “Why didn’t you talk to me about this before?” Talis said, his voice low and fearful. Hi Jack, thanks for the note! Hope you enjoyed Star Mage. Book 6 should be available early in 2015. If you get a moment I would love a review on Amazon! Cheers, John.